Serendipity designed the Danger Doll Submersible Airship (the current airship is third generation) as a flexible service vehicle to transport the Danger Doll Team quickly and efficiently to remote locations. As such it has a dozen staterooms, lounge, galley, gym, and a large freight bay located inside a two-piece hull of aluminium molded over a tru-steel frame with the bridge suspended below. The airship is 454 feet in length and 144 feet in diameter at the widest point, carpeted throughout by Nazrudden with an anti-magic weave. The nose of the airship consists of a large intake area that draws in either air or water. This super-accelerated and pressurized fluid medium is then forced out a central ring of slits in the side of the craft (think fish gills), and forms vortices along the outside section of the blimp, allowing for reduced friction and a "slip" effect as the craft travels through air or water. A high degree of mobility is afforded, and the craft is first pulled through the medium, into the frontal vortex, and additionally, squeezed through, compliments of the greater pressure exerted by the expelled air or water traveling aft of the craft. This is an application of InVALID® technology. Additional outboard pods, fitted with smaller conventional electric motors afford a high degree of directional control and stability and are particularly effective for maneuvering and landing the craft. The craft generates its own electrical power internally through use of turbine/pump units driven simply by its own movement through the air and then stored in rechargeable batteries. Sara estimates that the lift mechanism of collapsible carbon fiber vacuum spheres can lift a payload of 540 tons and the slip-stream propulsion system can achieve speeds of over 666 knots or more in the air or at sea, although to date the airship has never attempted to break the speed of sound. The present airship has been equiped for space travel as well, using Electromagnetic Propulsion sails (EMPs) for interplanetary travel and a Dimensional Displace Drive (DDD) for jumps into deep space. Advertising - The airship can hover over densely populated areas like a large billboard in the sky, displaying teasers or even a live feed on it's projection hull. 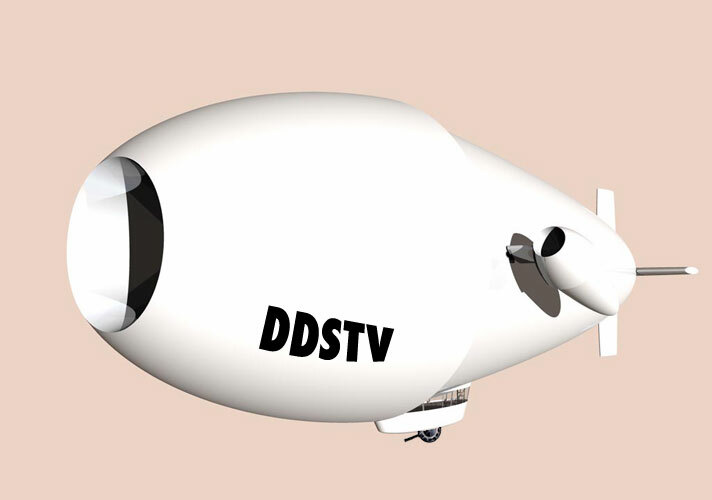 With DDSTV emblazoned on its hull the airship often flies like a flag from the mooring spire of Danger Dolls Satellite Television Tower. Crime Fighting - The airship is the perfect vehicle for observing the city. It is equipped with the expected radar, sonar and GPS tracking systems. There are tubes near the nose for firing missiles or torpedoes and a perplexiglass ball turret water cannon under the bridge for fighting fires. Fire Fighting - With its amazing load capacity the airship can dive in the harbor, pick up more water than any plane or helicopter ever could, position itself near a skyscraper and fight fires on upper stories which have been nearly unreachable heretofore. Media News Coverage & Broadcasting - DDSTV has the ultimate news coverage craft to act as a mother ship for its fleet of hovercams. Susan MacDuff can cover a media event from the bridge and have all the necessary media equipment and transmission devices ready and available on-board. Talk about getting the scoop! Search & Rescue Operations - With this airship dozens if not hundreds of victims can be transported away from a disaster scene in very little time by just one trip. The freight elevator located behind the bridge can drop down and pick up as many as fifty or more people at a time. Without the inherent "propeller wash" from a conventional helicopter, rescue operations of people trapped on higher floors can be facilitated with less risk.